OK, OK...I know it's a fuzzy picture and I promise I will try to take a better one, but I thought it more important to get a post in while I can. My DH has taken over the home office for study while he's been in an intensive Law Enforcement Management Course that the manager-type people at his work have been doing this year. So, I have not had access to my computer in the evenings lately. See? What goes around, comes around. As Dolly Levi said in "Hello Dolly", "Money, pardon the expression, is like manure. It's doesn't do a darn thing unless it's spread around encouraging young things to grow!" This is my philosophy for many things in life which I will not get into right now, but you get the general idea. So when ya'll see some of these New Zealand apples and Zespri kiwifruit (not those Californian or Chilean kiwifruit - bypass those) in the markets now, please try them and think kind thoughts towards our New Zealand branch of the family tree. 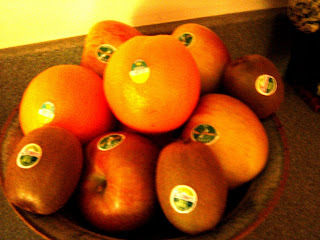 They (New Zealanders) take a lot of pride in making sure you get to enjoy the "fruits" of their labors. And that branch of our tree is one that we are very fond, and proud, of. We couldn't have asked for better relatives! If you want a really, really good chuckle to help you through this week, read Becca's great entry on Etiquette in the Barn. What a wonderful take on feeding time! Thanks, Beccs...you're one of a kind! OK, OK...Tina and Becca....I got the message. Here it is - a Blog entry, FINALLY! I have to say that I haven't been blogging, but reading and walking lately. It's been hot to where you'll do anything not to move during mid-day and our home office seems to be the hottest room in the house. The last time I talked to Tina she mentioned the Great Sweet Pea Experiment I was doing this year. 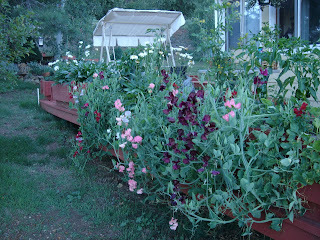 We have flower boxes on our front deck and I had this great idea to plant sweet peas in hopes they would cascade over and cover some of the space under the deck. The photo is the outcome of this "Great Idea". They are now starting to really acquire many blossoms - enough to show up in a photo, at least. The white ones are extremely fragrant. And a big factor - they haven't been eaten by our infamous "Rats-With-Antlers"! Hmmm...I wonder if it's because the elk have plenty of grass this year or do they just not like sweet peas? The elk drive the sheep absolutely bonkers. Not from chasing them, or coming over into our pasture, but I think it's by their mere presence. One of the ewes, especially, will bleat loud and long to let everyone know there are elk coming close to "her" pasture. Even if she's in the barn, closed up for the night. She must believe she's some sort of early warning system. I have to say this "Being Good" part of my recuperation from has been very hard for me. I am not a person who just likes to "not bend" for three months. Try it out sometime. Try going through part of your day without twisting or bending your spine. No lifting, except for maybe a tissue fallen to the floor and when you go to reach for it, don't use any bending of the back. Keep it straight and bend only with your legs as a ballet dancer would. Uff Da! :) I will either have very strong legs or my knees will give out before my next Dr. visit! I did take a few pictures of the lambs having their ears tagged this past weekend and IF I can find where my DH put them on the computer, I will try to post one or two. That's right, we ARE official and the lambs are up for sale! I will try to get some "nice" pictures (current ones) of everyone. I walked down to the barn this noon to make sure everyone has fresh water and I wanted to spray fly repellent in the pens in the barn. It's hot today! Even Skit came out from under his lean-to to take the tender leaves from the apple tree I picked for him, then went right back under into the shade as soon as there were no more leaves. He's no fool...the shade is where to be today. Rain has been forecast, but not until later in the day. Until later we all must endure the hot. At this altitude, the sun can be more brutal than south of us in the Phoenix area. It'll fry you in about five minutes in the summer at 80+ degrees. Locals can tell who isn't from here as most visitors leave with roaring sunburns and puzzled looks as to why they were burned when it wasn't as hot as home. The news people always do the egg-frying-on-the-sidewalk thing here in Arizona in the summer. And I knew exactly what that egg felt like as I came out of the house. There is no breeze. The fans in the barn are going full blast. Everyone is getting ready to "siesta" until the cool of the evening. I know now that summer has dropped from the favorite season when I was a kid catching fireflies in jars in the Midwest. I'll take a cool Fall or cold Winter day over this anytime...and you're welcome to remind me of that statement next Winter!